An innovative, independent real estate brokerage may have gotten a little too innovative about copyright law when it featured murals by San Francisco artists in marketing materials without seeking their approval, touching raw nerves over gentrification in the process. Zephyr Real Estate — which made news last year by partnering with Urban Living Marketing to provide neighborhood-specific apps, and with RealScout to provide a branded collaborative search platform to clients — has been hit with a copyright suit by eight artists who say the brokerage failed to obtain their authorization to use their work in a promotional calendar. 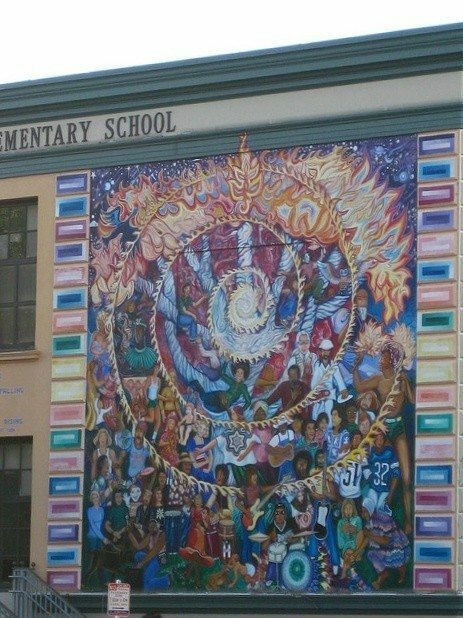 Spirit of Mankind, a mural by Susan Kelk Cervantes, was featured in the calendar. Photo: Liz Henry/Flickr. Artists have been among those hardest hit by rising rents and home prices in San Francisco, and those whose murals were used in the calendar to promote neighborhoods and properties were not amused. “It just rankles that a company that is selling multimillion-dollar homes and really contributing to the gentrification of the city uses these beautiful pieces of public art for their private profit,” an attorney for the artists, Brooke Oliver, told Courthouse News Service. The copyright lawsuit alleges that Zephyr Real Estate distributed printed and digital versions of the calendar more than 9,300 times, halting distribution only after being served with a cease-and-desist letter, the SF Weekly reports. Zephyr Real Estate President Randall Kostick told the SF Weekly that the cease-and-desist letter was the first he’d heard that there were copyright issues, and that all copies of the calendar had been turned over to the artists’ attorneys in May. An animated video promoting the calendar was also removed from the brokerage’s website, he told Courthouse News. Kostick said that the brokerage did not intend to use the images for profit, and that Realtors aren’t to blame for rising home prices and rents in San Francisco. “The artists can say, ‘You guys are involved in the gentrification that’s taking place,’ but the bottom line is we’re not creating that gentrification,” Kostick told Courthouse News. Gentrification has become a contentious issue in San Francisco, as longtime residents are pushed out of popular neighborhoods like the Mission District by an influx of younger, well-paid tech workers. Many artists and others who can’t afford rising rents have relocated across the bay to Oakland and other nearby cities. Fairly or not, real estate brokers and agents are often blamed. Protesters alarmed at the impact of tech workers moving into San Francisco have had on home prices and rents last year blocked shuttle buses taking workers to Google and Facebook. The protestors stopped at the San Francisco Association of Realtors’ headquarters on their way to a rally at City Hall, with one woman shouting, “This is ground zero for the battle of renters in San Francisco,” through a bullhorn.